I had heard that the best whitening strips would be one of the most effective methods for whitening my teeth. So, it was one of the first methods that I investigated. But, do teeth whitening strips work? I found that over-the-counter teeth whitening is popular because it is one of the quickest and easiest ways to brighten your smile. Do You Want the BEST Teeth Whitening Strips? The best whitening strips were pretty easy to find, but I found that it is also important to choose the brand and type that best fit your needs and lifestyle. These products contain a different mixture of ingredients and require varying amounts of commitment. So, what might be great for me might not be a good fit for you. Below are some of my notes about the various factors that go into picking the right product. If you have additional comments that I should have touched on, please leave a comment in the notes and I’ll try to investigate that aspect and add it to the page. 1 What to Consider When Choosing Whitening Strips? What to Consider When Choosing Whitening Strips? There are several questions I found were important to ask myself to ensure I was getting the best white strips, but am still providing a great level of oral health. I found that not all strips are created equal. So, not all brands and systems were right for me (and probably won’t be right for you). Teeth with severe staining may not get as white as you expect on your first teeth strip attempt. It is important to have realistic expectations with the product that you choose when you’re asking the question Do Teeth Whitening Strips Work? You also want to note the type of staining you have because these kits are meant to lighten extrinsic stains, or stains present on the tooth’s surface. If you have deep intrinsic staining on the dentin layer of a tooth, these may not work to whiten your teeth. I found that I have both extrinsic and intrinsic stains. So, my expectations were that I should be able to obtain some level of improvement. But, I shouldn’t expect to get one of those “glowing” smiles that I see on TV without some other form of teeth whitening method. If you have several caps, veneers, fillings, crowns, partials or laminates, consider the fact that even the best whitening strips may not whiten these. So, sometimes the answer to the question Do Teeth Whitening Strips Work? … is NO. This can lead to uneven whitening with stark differences in the color of your individual teeth. You also want to talk to your dentist before using these products to ensure it is safe for you. I have several fillings. Most of them are not on the surface that faces outwards. So, before I started, I felt good that I wouldn’t have a bad experience where parts of my teeth got whiter, but others didn’t due to my dental work. If you already have tooth sensitivity, consider the strength of the ingredients in the different brands of white strips. The stronger the concentration of peroxide, for example, the more likely you are to experience discomfort associated with sensitivity. There are some brands that have gentle options that are created specifically for sensitive teeth that you may want to look at or discuss with your dentist. My teeth go from being sensitive to not being sensitive. So, I was a little worried about this. Below are some products I investigated. As I try different products, I’ll be posting reviews and talk about whether the product was hard on my teeth or not from a sensitivity standpoint. You need to consider your schedule and how much time you have to dedicate to using these strips. There are some options that require little time and you may only need to use the product for a few minutes per day. However, other options require you to use strips twice a day for up to an hour each time. Make sure to read the instructions so you fully understand the time commitment required because you typically must use these exactly as directed to get the advertised results. Personally, I’m the lazy type. So, I needed to be careful about this aspect. Like many of you, I tend to be “all in” at the start, thinking that I can sit there and “do something else” while I have a set of strips on my teeth for 2 hours. But, I can’t typically keep something like that up for an extended period of time. This means products with a shorter commitment time are the best for me. I realize that this might also affect my results. So, as I go along I’ll talk about how my level of commitment changes and if it needed to change to get the best results. Before looking at the different best whitening strips, determine your budget and limit your search to those products that fit that budget. Depending on the brand and specific kit you choose, you can expect to pay between $20.00 and $100 for over-the-counter kits. I am already in the hole paying for this website. So, one of my goals here will be to start with the cheap stuff (inexpensive) and move my way up as either the site makes money, or I find something that really makes a difference that is inexpensive. While investigating teeth strips, I found this video that had some great information about choosing the best whitening kit. While researching the best whitening strips, I found a great tip. It was to be sure to practice good dental hygiene before using whitening strips. Before applying the strips, it is a good idea to brush and floss your teeth so there is no plaque or tartar blocking the whitening affects. If this isn’t done well, you can end up with uneven whitening results. Give it an hour or two after brushing before putting the strips on so that they adhere better and to reduce the risk of gum irritation. After removing the strips, use your toothbrush to gently brush away any remaining residue and then rinse your mouth with plain water. I found that there are many different brands and types of whitening strip kits available. So, I compared them to determine the best one for me. Hopefully, you can use this same information to find something that also works for you when you are asking yourself do teeth whitening strips work? 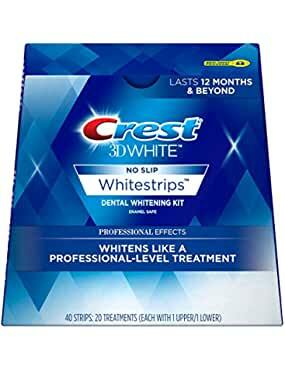 Crest 3D White Intensive Professional Effects Teeth Whitening Strips are used daily. You wear them once a day for 30 minutes, but the results are immediate. There are 40 set of strips (each set contains a strip for the top teeth and one for the bottom teeth). So, 20 uses if you count doing both the top and the bottom teeth in one sitting. The results last for up to a year and beyond. Of course, that doesn’t mean you can go out and soak your teeth in coffee or tea and it provides any protection from that. But, if you take care of your teeth and don’t do anything to stain them more, you should see lasting results. Since strips are professional grade strength, consult your dentist to ensure it is safe to use these for a full week of time. So, do teeth whitening strips work? YES!! 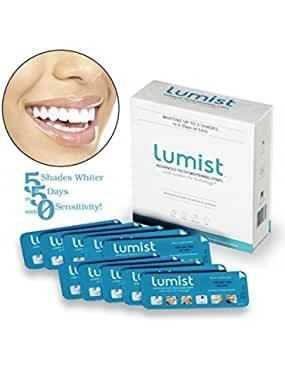 Lumist Advanced Teeth Whitening Strips are applied once a day for five days. The box doesn’t tell you how long to keep them on. It just says anytime, anywhere. I think the idea is that you can wear them for long periods of time while you are out and about. Several users said they did just that. One person said they wore them approximately an hour and thirty minutes a day, and that the strips “whitened my teeth nicely “. Lumist uses what they call Comfort Fit Technology. This is what allows the user to do other things while their teeth whiten. The main whitening ingredient in Lumist is carbamide peroxide, but, it is not listed as the top ingredient. We believe this is why they can claim that you will have “0% sensitivity” while using this product. Typically that mean the whitening doesn’t work as well. However, users seem to find this product to work well. Rembrandt Intense Stain Dissolving Strips melt away so there is no need to remove them. They are supposed to stay in place for between 5 and 10 minutes and you use them twice a day. The recommended length of treatment is two weeks. These Rembrandt strips come in a minty flavor so you feel like you are just using one of those breath strips. The product is good for stains caused by things like coffee, smoking, tea, or dark sodas. Sheer White Teeth Whitening Strips are used for five consecutive days with each treatment taking one to two hours. 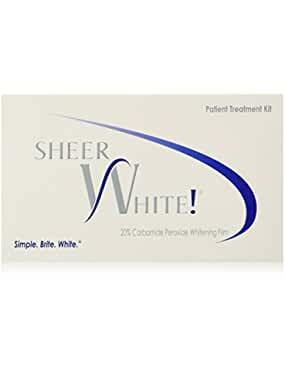 These are typically sold at the dentist’s office since they contain 20 percent carbamide peroxide, which is stronger than over-the-counter best whitening strips. If you decide to get Sheer White, be sure you refrigerate the product between uses. If you don’t, the strips will go bad quicker than if you do refrigerate them. But, you can find them here (save extra money on this two pack) for your convenience. These strips are longer when compared to other strips and they are made to stretch from the first molar on one side of your mouth all the way over to the first molar on the opposite side. So, do teeth whitening strips work? Today’s best whitening strips are effective, but the results you get ultimately depend on your teeth and how your teeth are when you start using the strips. For example, those with extrinsic staining are likely to experience better results than those with intrinsic stains. However, there can be exceptions to this. You also want to choose a kit with requirements that you can manage because it is important to use these exactly as instructed to get optimal whitening results. Most kits allow you to use a good whitening toothpaste to maintain results and help to enhance whitening during the process. I hate this saying. But, unfortunately, when answering the question Do Teeth Whitening Strips Work?, the best answer is Your Results May Vary. Well, we’ve learned a lot about the parts of your teeth that can be whitened. And, we were able to find some quality products that do a great job whitening your teeth. We hope you’ve enjoyed learning about teeth whitening as much as we did doing the research. Hopefully you can find one of these products effective for your teeth whitening needs. We feel pretty good about finding the Best Teeth Whitening products that can get the job done.